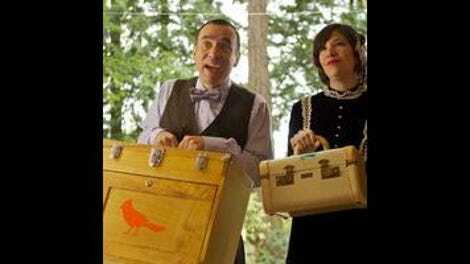 While the first two episodes of Portlandia this season have offered up some solid sketches and consistent laughs, I admit to being a bit disappointed in the early going. My favorite flavor of Portlandia is when the show’s trying to step outside its boundaries, which is why I was such a fan of the third season’s attempt to transform its universe into a narrative ecosystem. And so far the show hasn’t established any similar groove—yes, it’s still early in the season, but this time last year there was a stronger sense that it was laying groundwork for something more. Consequently, I found “Celery” to be a welcome shot in the arm for the show. It doesn’t return to the serialized approach of last year—or if it does it’s in ways not easily detected—but it does restore some of the imagination that I’ve felt was lacking in the first few sketches. Portlandia gains a lot of mileage out of the heightened reality of its universe, and these sketches restore both the scope and the surreality that the show is capable of in its finer moments. From there the third act of the sketch is twist upon twist, as Marty’s approached by a representative of the FBI (played by Grimm’s Silas Weir Mitchell) looking to bring down “Big Bacon.” First he agrees to wear a wire, then after panicking he realizes that the FBI are in fact agents of the long disenfranchised corn lobby, and then the entire sketch is exposed as the plot of the latest John Grisham novel designed to market celery as a dangerous vegetable. On a lesser show this would feel like hitting the eject button on an idea that doesn’t work, but the whole affair has built to such a heightened reality that it makes as much sense as anything else in the story. If the celery runner is an example of Portlandia using its structure to do something new, the social bankruptcy plot is an example of the show finding a smart way to revamp an old reliable. The sketch is essentially Technology Loop 2.0—Carrie’s overwhelmed by the constant flow of messages and social media updates—but rather than being consumed by it she decides to cut it off entirely with the help of Geoffrey, another Kumail Nanjiani bureaucrat. The technology loop sketch was about overload, and this one is about the void when that overload is removed. With no profile on Facebook, Twitter or Instagram, Fred has no way of recognizing her, to the point that she fades away entirely when running away—past a Fred whose status update simply reads “Lonely.” Portlandia’s satire works best when it’s low-key, and this fade out gets the point across better than a bombastic punchline. Other sketches are more grounded, but remain thematically connected thanks to their focus on food. The opening sketch places both Armisen and Brownstein as frizzy-haired employees at a 911 response center, dealing with calls about “blood everywhere” and filled with hysterical sobbing. The twist is that every problem is related to the consumption of beets—beets apparently being the anti-lupus—and they’re able to solve every call with that answer, even the ones involving actual disasters. (The latter featuring the welcome return of Jeff Goldblum, who reaches peak Goldblum levels when he’s in Portlandia.) The constant switching between “dramatic tension” and “everything’s going to be all right” musical themes keeps the energy level high, and the various self-centered asides from Armisen (“They can’t see me rolling my eyes”) ties it into the recurring theme that everyone who performs customer service in this world is terrible at it. Certainly that applies to the Order Grill sketch. Portland’s newest restaurant is designed to offer up the highest level of customization for every meal, except it adds so many layers to the experience that the meal itself never happens: soda and ice stations at opposite ends of the terminal, three different ways to receive your order but it all boiling down to a server yelling your order out to the masses. Once again, it’s not far off from some of the dining experiences from hell that Armisen and Brownstein have delivered before, but it’s the commitment to this terrible idea that sells the sketch—particularly Brownstein channeling Tilda Swinton as the restaurant founder. “What I’ve done is I’ve changed the type, the entire essence of ordering,” she says to a bemused customer right before sending her down the pastrami rabbit hole. Portlandia is all about good ideas that become terrible, but this is in a new league: an idea that was terrible at first and then only makes it worse. This Week in Portland: Carrie’s first stop post-emancipation is the Red E Cafe, a shop that’s a favorite of Brownstein’s in real life and that makes a mean pour over coffee. A definite treat to see Weir Mitchell stopping by. It’s a bit surprising that it’s taken both shows this long to feature any sort of crossover, given that they’re both shot in the same city and draw from the same pool of supporting actors (the head of the Wesen Counsel and Fjohürs Lykkewe from “Bring Back MTV” are one and the same). Perhaps in the future Armisen and Brownstein could appear as Wesen? Reggie Lee and Russell Hornsby could play cops in a Portlandia sketch? Please offer your suggestions below.